The following information and calculation tools can be sent here as an Excel file via email. All calculational bases and information in this guide have been carefully prepared with reference to EURAMET/cg-10/v.01 of July 2007 and various standard procedures. 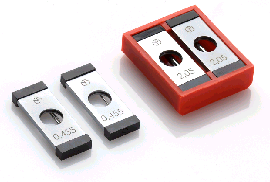 The selection aids for suitable test wire diameters are based on DIN 2269 : 1998-11. However, mistakes, errors and changes cannot be ruled out. We offer no warranty, guarantee or liability in this respect. The user is solely responsible for the suitability of the measuring equipment and procedures chosen and their correct implementation. We recommend that you observe the current version of the EURAMET/cg-10 guideline (formerly EA-10/10; German translation offered by the Swiss Accreditation Service SAS: "Leitfaden für die Bestimmung des Flankendurchmessers von parallelen Gewindelehren durch mechanische Prüfung", document no. 211.dw), relevant standards and literature on this subject. 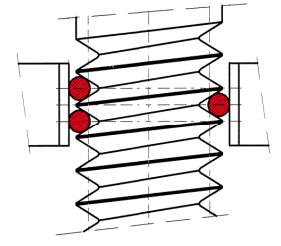 The three-wire measuring process is one of the most precise procedures for determining the pitch diameter of threads. 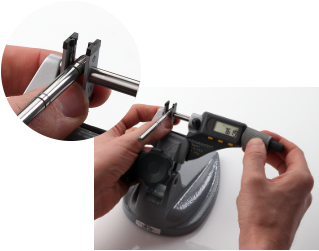 The M+T thread measuring wires with micrometer holders combine this procedure with unique handling ease, measuring security of the highest order and absolute efficiency. 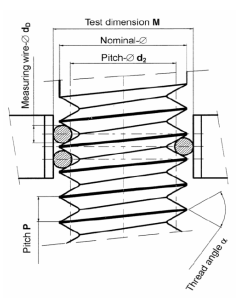 The corresponding measuring wires position themselves after they have been affixed, through the integrated washer spring, to the spindle of the measuring screw using the pair of holders. The selection and calculation aids listed below provide additional practical assistance. In practice, you will often be working with a graded thread measuring wire diameter in accordance with the Zeiss thread measuring wire series. This can be found in DIN 2269 : 1998-11 / Table B.2. The following table was compiled with reference to this DIN standard. In the interests of simplicity, corrections for possible deformation of the measuring wires and measurement uncertainty are not taken into account in the following tables. By reversing the calculation bases shown above it is possible to calculate the flank diameter for a known thread specification on the basis of the measured test dimension M. The following table may be used (assumptions and calculation bases as above).